The PRP (Plasma Rich Plate) is the new innovation in hair surgery. The positive effects of treatment with platelet growth factors for androgenic alopecia surgery. After having been tested for more than 4 years in our center, the result of the use of PLASMA’HAIR® in the various stages of the hair transplant is now obvious. PRP increases the proliferation of capillary dermal cells, protects against apoptosis (programmed cell death) and enhance the survival of hair follicles. It stimulates the growth of the hair by causing the transformation of stem cells into hair follicles and other skin cells while extending the anagen phase of the hair cycle. PRP is a natural substance that is obtained from the patient’s blood. A simple blood test is enough to realize the PRP for a capillary surgery. PRP is obtained by centrifuging the blood to concentrate naturally the platelets in the plasma. Plasma and platelets are two distinct elements. This plasma with high platelet concentration is used in hematology, orthopedics, cosmetic surgery and reconstructive surgery for many years. 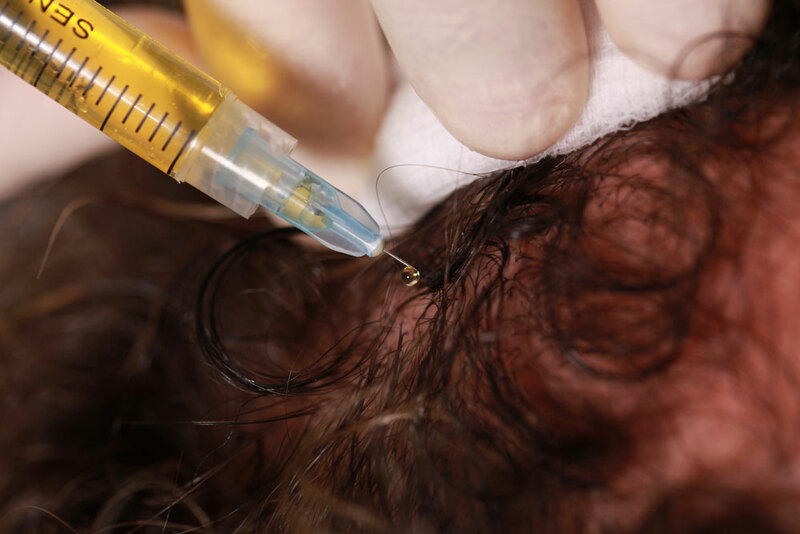 The areas treated with PLASMA’HAIR® showed an increase in the density of hair follicles of nearly 20% as well as an increase in rapidity of hair regrowth.